The Kangri dialect, in yellow. Kangri is a dialect spoken in northern India, predominantly in the Kangra, Hamirpur, and Una districts of Himachal Pradesh and in the Gurdaspur and Hoshiarpur districts in the Punjab state. It is associated with the people of the Kangra Valley. 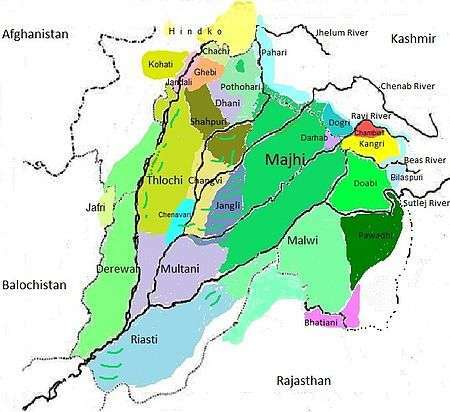 It is an Indo-Aryan dialect, related to Dogri and today classified as one of the Western Pahari (पहाड़ी) group of languages, with some influence in vocabulary Standard Punjabi (Majhi), which is spoken to the west in the state of Punjab. Kangri, along with Dogri, has been classified as a dialect of Punjabi by linguists but since the 1960s, both have been recognised as dialects of a separate language group called Pahari. Kangri was regarded as one of the many varieties of Punjabi until the 1971 Census of India when it was reclassified as a Hindi dialect. ↑ Hammarström, Harald; Forkel, Robert; Haspelmath, Martin; Bank, Sebastian, eds. (2016). "Kangri". Glottolog 2.7. Jena: Max Planck Institute for the Science of Human History. ↑ "Social Mobilisation And Modern Society". Singh, Amitjit. "The Language Divide in Punjab." Sagar, Volume 4, Number 1, Spring 1997. Goldsmith, Parvin. "Scripture in Kangri recordings (mp3s)" 2007.